You may remember last year my contributor, Matt’s, recap of his visit to the 2015 North American International Auto Show (NAIAS) in Detroit. This year Ford generously sent me an invitation once again to cover NAIAS 2016 and share with you guys the latest happenings. Check out what’s on the horizon from Ford and my first trip ever to the Motor City! Unfortunately due to some weather delays, I was delayed in the Nashville airport for 13 hours and missed out on the opening night events. 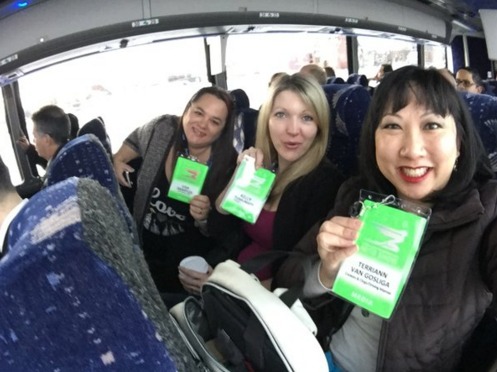 As if this wasn’t disappointing enough, Ford hosted journalists at Ford Field. I may not be a fan of the Lions, but as a football loving girl this was the ultimate event. Not only did everyone dine at the stadium, they were also given a private tour of the facility including the locker rooms, and were able to spend time on the field and attempt a field goal. This was a once in a lifetime experience that killed me to miss, but I’m hopeful this won’t be my last visit to Michigan. After a quick 3.5 hour nap in my room at the Detroit Metropolitan Airport Westin, it was time to get my whirlwind experience at NAIAS started! In addition to all of the friendly and familiar faces from Ford, I was also able to meet up with friends from our Explore More trip through Canada in September! Lisa Samples from Life with Lisa and Terri-Ann Van Gosliga from Cookies and Clogs were both there and you can check out their thoughts and take aways from the show as well. When we arrived at Cobo Hall in downtown Detroit, I was blown away with just how big the convention center was and how much there was going on. I’ve been to car shows with my dad before when we lived in Colorado, but they were nothing compared to this. The entire place was humming with excitement even at an early hour and Ford had a commanding presence as soon as you walked in the doors. 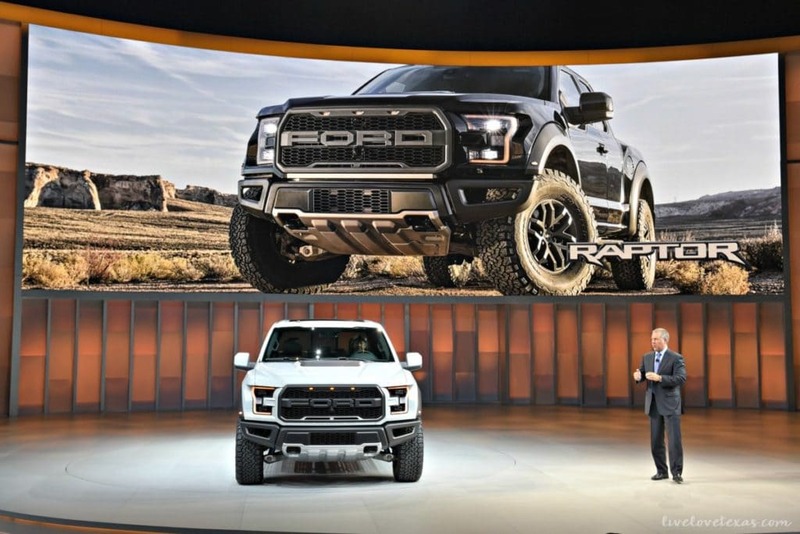 Ford had big news to share on the first day of the show. 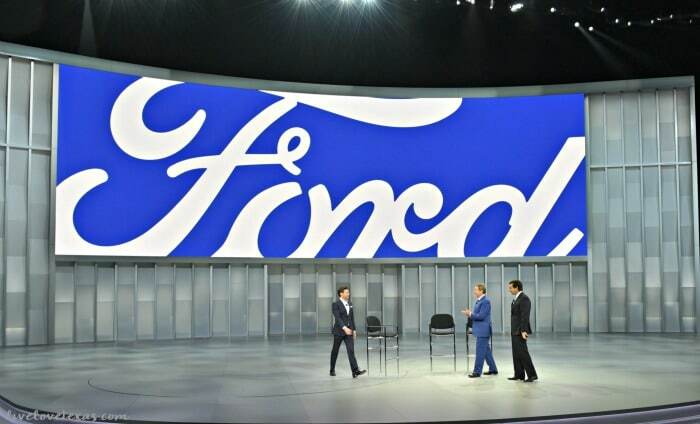 Hot off his red carpet hosting duties at the Golden Globes the night before, Ryan Seacrest came to host an open discussion between Bill Ford and Mark Fields about the future of Ford. Ford was founded on making people’s lives better and the biggest takeaway from this discussion is while Ford continues to be a leader and delivering growth in transportation, they’re now striving to be a serious player in mobility. So what does being a serious player in mobility really mean? It means that Ford is working hard to integrate all sorts of features like monitoring biometric technology (think your FitBit), managing the thermostat for your home (with your Nest? ), and working with IBM to find travel alternatives to gridlock and good parking spots. This is the type of stuff that makes anyone’s life, but especially a busy mom’s, easier. 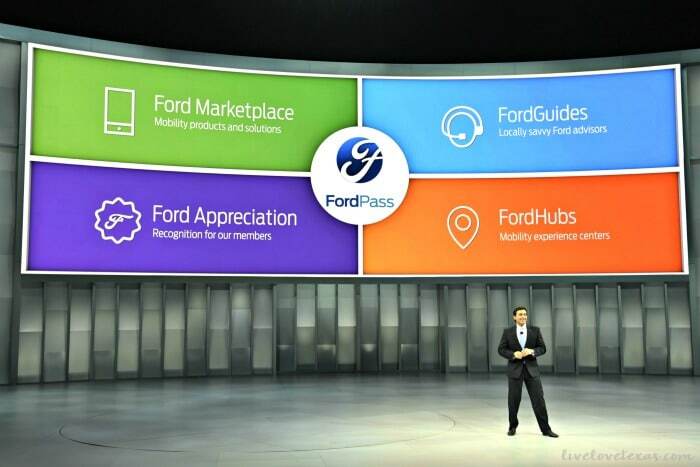 Ford also introduced FordPass which reimagines the entire customer experience. It launches in April and anyone (Ford and non Ford owners) can download the app. The FordPass will continue to grow and evolve over time with the mission to guide, serve, and solve…not sell. Have you heard about autonomous cars? These are the driverless cars of the future and Ford has the largest autonomous testing fleet.Ford plans to take autonomous vehicles to the ultimate level and have been testing these vehicles on roads in California, Arizona, and Michigan as well as being the first company to test vehicles in the snow. 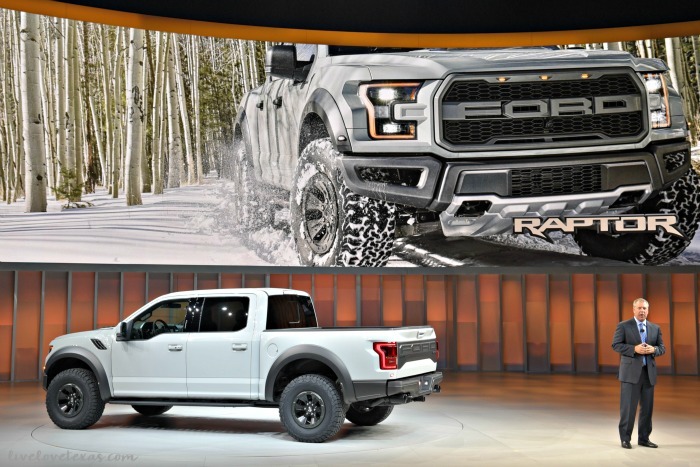 Every 19 seconds someone is buying a Ford truck and the first of the new vehicles that was introduced is the 2017 Ford Raptor SuperCrew. While I may drive the F-150 Platinum, the sporty look of the Raptor is not lost on me and I’m in love with the new lines and enhanced features. Trucks can really be a great alternative to other vehicles even with a family. We use our Ford F-150 for everything from preschool drop offs and grocery shopping to moving to long road trips. Versatility and comfort are definitely huge perks and something to be considered when you’re shopping for a new vehicle. 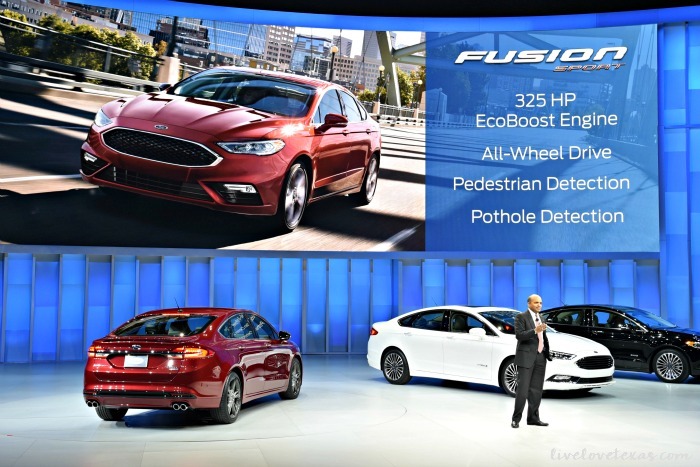 However if you’re in the market for a new car, you may want to wait until the new Ford Fusions are released. In model year 2017, Ford is releasing four new models – the V6 Sport, Platinum, Energi, and Hybrid. I love when a car can just get up and go and the 325 HP EcoBoost Engine in the new Sport definitely caught my eye. Not to mention the All-Wheel Drive, as well as Pedestrian and Pothole Detection. Ford’s final announcement was geared towards the kids. They’re now partnering with LEGO to create the Speed Champions series. 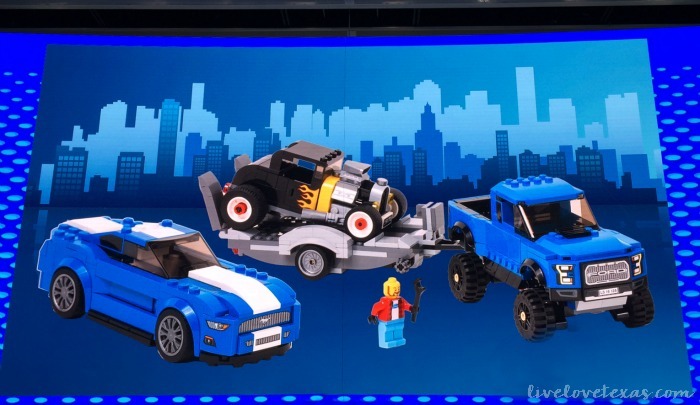 This unique line from LEGO will feature the Model-T, F-150, and Mustang. How fun is this? Your little ones can play with LEGOs that look just like mom and dad’s car! 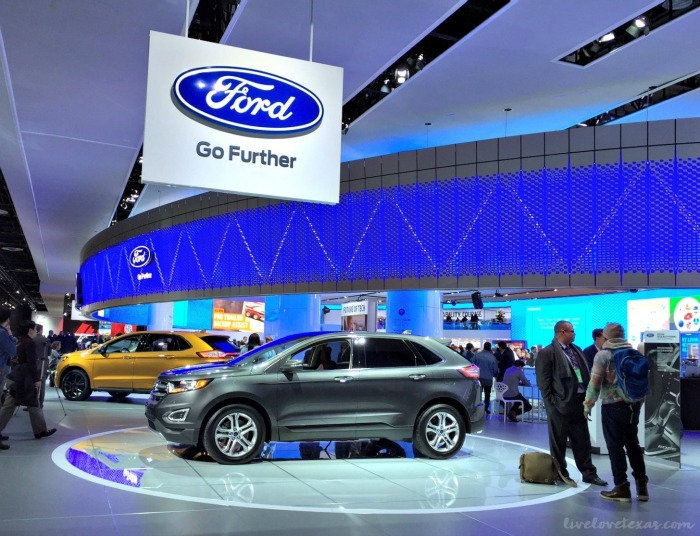 Which new Ford vehicle or feature are you most excited for? If you’re in the market for a family friendly SUV, check out my review of the 2016 Ford Explorer Platinum!